Dr. Maya Angelou passed away peacefully on May 28th. 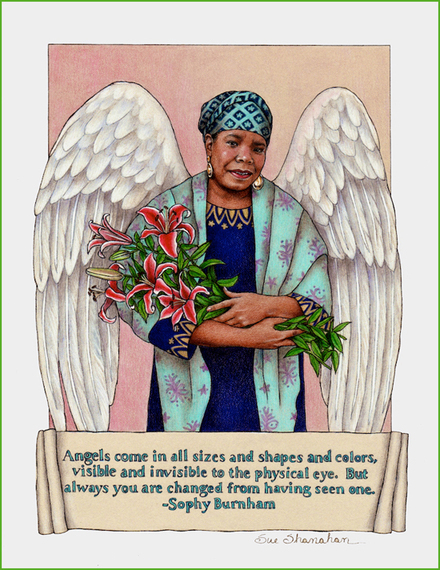 She was a poet, memoirist, performer, educator, activist and mother. In 1982, when she took on a professorship at Wake Forest University, she knew she had come home. To her surprise she discovered she hadn't become a writer who taught but was now a teacher who wrote. And teach she did. Many of us were introduced to her by Oprah Winfrey. Oprah took joy in sharing the life lessons she learned from her mentor. Today, many of those insights roll off my tongue. Whomever I quote them to invariably thinks I'm brilliant. Of course, I have to confess those wise words didn't originate with me. I can only accept credit for being smart enough for taking Maya as my own. I first read I Know Why the Caged Bird Sings when I was twenty. Maya was an artist who painted with words. It was the first time I had read such an honest, intimate account of sexual abuse and the struggles of being black and a woman. I was not black or sexually abused, but I am a woman and knew how it felt to be treated as "less than." I had an immediate connection to the author. On the surface we were nothing alike and yet she somehow knew my heart. I learned that as a young girl Maya sat in the balcony of a movie theater, reserved for blacks, waiting to grow up and become rich, beautiful and white. Thirty years later, I sat in a theater waiting to become that same woman. It never happened for either of us but watching Maya embrace her unsung beauty gave me, a white girl uncomfortable in her own skin, permission to do the same. As an adult, Maya boldly never edited who she was. I admired that but didn't think it was possible for me to be that way until I read an interview with her in O Magazine. In it, Oprah asked her where her confidence came from. I was expecting Dr. Angelou to say it came from being raised by her stable and loving grandmother. But no, she explained that it sprang from love. She didn't mean love in a sentimental or romantic sense. What she was talking about was much bigger than that. She was referring to a state of being so large that it's inconceivable. Knowing of all the strikes that had been against her, assured me that that kind of love is available to everyone. If bidden and allowed, it will hold anyone's head high and move through them to fulfill their life's purpose. I'm grateful Dr. Angelou had the presence of mind to document her life in books and interviews for all of humankind. Even in death, she will continue to teach. I smile when I think of how God brings greatness out of the most unlikely people. Thanks to Maya's heeding the call, a six-foot-tall, black woman is no longer considered an unlikely candidate for anything. The concept for the above portrait came to me when I realized the word "angel" is in Dr. Angelou's last name. I dressed her in the garb I imagined her ancestors wore and placed stargazer lilies in her arms. They're fitting flowers for her to hold because they mean one who is "high-souled" or spiritually evolved. I find hope in knowing she didn't start out that way. From a turbulent childhood, she grew into a seeker of truth and then lived what she learned. She followed the yearnings of her soul and became part of a movement that raised our country's awareness of social injustice. She was an earth-shaker and a mountain-mover. She left none of her gifts unused. And for that, dear Maya, we thank you.